Recently I answered a Freecycle ad for a Swedish Bible. Not that we really need another Bible (we own at least 8 various ones) or that we could read the Swedish language, but I answered anyway. I wanted to see what one looked like. What I found was a treasure. It was a sunny but chilly day when I picked this up from a friendly gentleman. 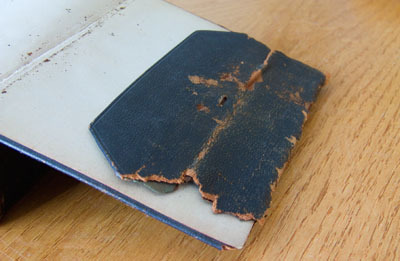 He handed over into my hands a Book that was weathered and crumbling in my hands. I held it gently as I opened it up to the front page. 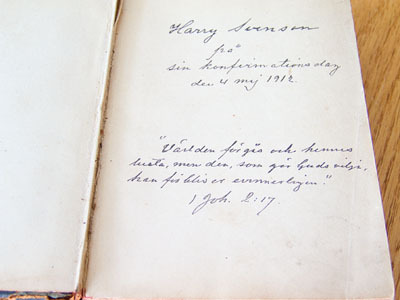 A handwritten inscription adorned the page. In Swedish, it was dated 1912. I took this Bible home and it sits upon our table in our reading room. I gaze upon it wondering what lives did this Good Book guide. Somehow, I feel connected to these Christians of a different time and I look forward to the hope that perhaps one day I will get to meet the author of the inscription in Heaven. What a great find! I would have snapped up that treasure, too. Beautiful piece of history and of someone’s life. WOW what a treasure – your post made me cry, silly maybe – but a beautiful book! Not silly, Jenn. I literally gasped finding out that it was inscribed and all. All I could think of was of past hands that have held this Bible. Oh WOW! What a beautiful, fascinating find! I SO understand why you’d be drawn to it. What an amazing piece of history! I love it! I work part-time at an antique store, so I am all about treasures from the past. What a beautiful find for you! I love that you will cherish it. What a shame the family that owned that did not. That always makes me sad. I wonder if you could find a way to interpret it? I am blog-hopping from Lacy’s blog! I enjoyed my “hop” here! Come visit me if you have the time! very cool and VERY old indeed! Gina, I was thinkin of trying to run it through BabelFish. If that is not successful I uploaded the picture to Flickr to see if there might be someone from Sweden who could translate. We’ll see! I love that you posted about this! Old Bibles are a true gift! Just turning the pages and thinking about the hands that turned them through the ages, and the tears that have blurred the print is a spiritual journey! Wow, great shots. I love old books. Actually I think they smell pretty neat. That is awesome! What a great find, and a really great verse for the inscription! So neat! You can never have too many Bibles! That is so cool! 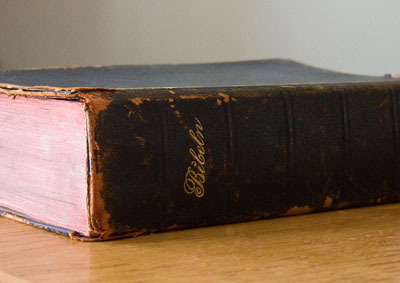 I love old books and bibles, and other things, they have so much unspoken history that I often wonder about.